An understanding of current irrigation systems, what is involved and how they work is essential if you plan to install or upgrade a system. Just as important is that you can save money by increasing productivity and efficiency of your irrigation system if you can improve the performance of the pump. This publication covers selecting the irrigation system that is best for your enterprise. It will also help you to select, operate and maintain your pumping equipment. What do you want your pump to do? Can a pump do what you need? 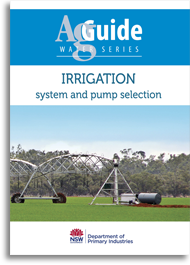 Published in 2014, Irrigation: system and pump selection is the first book in the AgGuide water series. It containx 125 full-colour A4 pages.